School Rumble will always be the one series that I will credit as getting me interested in the art form. It is, however, not the first anime series I ever watched. There was a drought of about 7 or 8 years before I stumbled upon that series, and before that drought, there was...the kid's series. 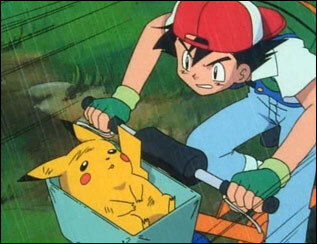 You'll feel 100% soon, Pikachu! Wait...wouldn't it make more sense for Ash to have his hat on frontwards? 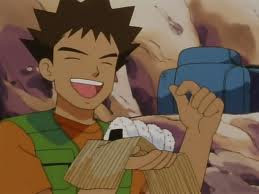 Even though most anime fans are reluctant to admit it, most have probably seen the awesome and horribleness that is Pokemon. While this isn't technically the first one I watched, it is the first I bought VHS tapes of. I remember saving my meager allowance just to buy a 3-episode tape for $10 at Wal-mart. I still have those tapes, though I don't know why. I got the entire Indigo series on DVD, so there is no need for them. I got all the tapes minus the last two or three, when I stopped watching the series. I won't do a huge review of the series today, but I will say I did recently rewatch the Indigo series and while I question my preteen self on why I liked this series, it's by no means a complete abomination. It's bad, yes, especially what 4Kids did to it (See above photograph of such ruining) at times, but it did get better as it went. I did watch the Orange League season and my opinion of the series plummeted. I did collect a couple VHS of the Johto League, but never saw much beyond that. By then I was an older teenager and watching a kid's show was no longer "cool". 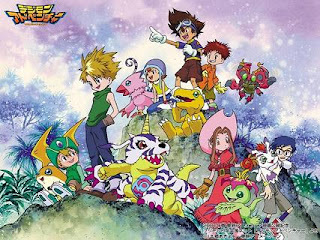 Digimon, digital monsters. Digimon are the Champions! Before Pokemon, though, there was a slight rip off series that was aired locally in my area on the Fox Kids block of animated episodes. It was called Digimon and I still hold a high opinion of some of it to this day. This was the series I followed religiously through the first two seasons. It was exciting and had much more adventure than Pokemon did. Episodes usually built on the previous one or somehow advanced the plot. There was a nice mix between fighting and plot advancement. The series tackled character issues and growth well. I looked forward to talking with my friends about it at school and we predicted what would happen next in the series. It was fun. Then the second series came out and the ball was dropped to some extent. I didn't get as excited about it and the ending seemed to be a little preachy to me, but it did close out the original arc. The third iteration, called Digimon Tamers changed locales and characters, and I never got interested in it because by that time I was busy with school activities, work, and sleeping. I did eventually watch it and I think it is better than the second series by far. Finally, to wrap up the kid's theme to this entry, there was Sonic X. While I rarely watched it on TV, I did catch what I could on DVD. The DVDs had more bang for your buck, so I had no issue collecting the entire series. For the most part, I do not understand the flack that this series receives. It really wasn't that bad...well, except for the last season, in my opinion. I can see some of the issues, like including humans and some slight edits, but overall I think it wasn't a bad series. I don't think it has the quality like Digimon had, but I can at least watch it. 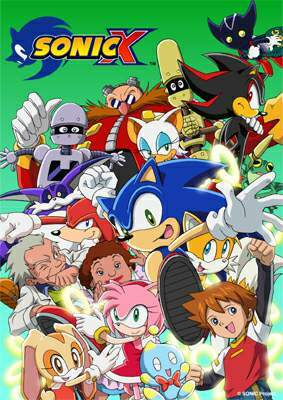 I stopped watching anime after Sonic X, until I made that fateful entry on my blog. It has taken me a few years, but I am sort of caught back up with anime. I really don't care for series pre-2000, but I do enjoy anime much more now than I used to. I hope you've learned a little about what I enjoyed and still do to some extent to this day. Cartoons and other shows and movies we used to watch as kids usually stay in a special place in our hearts. Most people try to deny those feelings, but they are there. So what series did you grow up with?